For anyone who has been involved in research, they know how satisfying it is to see the scribbled notes on the margins of books turn into a 20-page essay or see spreadsheets of data transformed into neatly labeled figures. 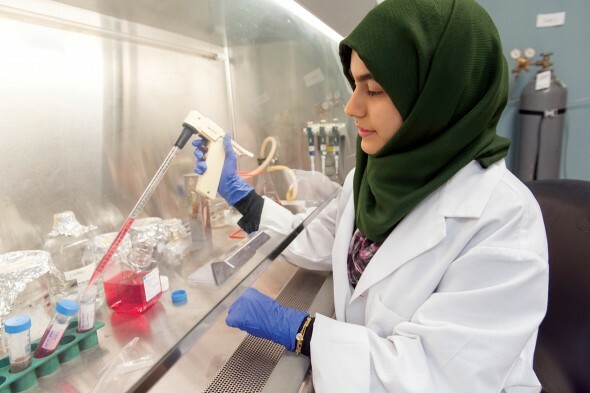 At UIC, opportunities to get involved in research in any discipline are vast. Most major curriculums provide resources for students to complete an independent research project while satisfying part of their graduation requirements. Some common structured research programs include Engineering Senior Design projects, Honors College Capstone projects, senior theses in the social sciences and humanities, and independent research in the natural sciences. Not only do these projects allow students to pursue academic interests outside of typical course offerings, they also usually qualify students to graduate with honors given successful completion. The Undergraduate Research Experience website is a great resource for students to get in touch with faculty who are willing to supervise undergraduate researchers. Students should also feel free to contact faculty members directly to discuss potential projects. Funding opportunities such as the Chancellor’s Undergraduate Research Award, the Liberal Arts and Sciences Undergraduate Research Initiative, and Honors College Undergraduate Research Grants are available to support student research. This past week some 300 students presented their diverse research at the annual Student Research Forum. The Forum showcases the best of UIC students’ innovative academic work. This year’s winner along with abstracts of all presentations can be found here. UIC’s Interdisciplinary Undergraduate Research Journal is another avenue for students to share their research. It’s a student-led, peer-reviewed journal that shares undergraduate scholarly research as a means of spreading knowledge and engaging scholars at all levels and across the world. Submitted papers undergo a peer-review process led by graduate students with expertise in the given field. The journal, which is published by the UIC Honors College, Office of Undergraduate Research, University Library, and Graduate College, is open-access, meaning that published articles are available online for public consumption. The submission deadline for the Fall 2018 issue is June 1, 2018. More information on submission guidelines, eligibility, and past issues can be found on the journal’s website. Hoda Fakhari is a senior studying biochemistry and English with a concentration in media, rhetoric and cultural studies. She is interested in making connections between subject areas that appear uncomplimentary in order to arrive at more diverse and relevant ways of understanding people and society.